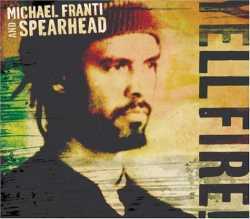 Two years ago, Michael Franti decided to travel to war-torn Iraq, Israel, and the Occupied Palestinian territories. To the Middle East, Franti took his guitar and a video crew, setting out to show the true human cost of war. Finally, he is releasing his film, “I Know I’m Not Alone”, along with the CD inspired by his trip, entitled “Yell Fire!”. Both have received critical acclaim. On the album, Franti wastes no time, opening the first track, “Time To Go Home”, with perhaps the most influential four bars of the album. This album reflects all of Franti’s past musical experiences (Beatnigs, Disposable Heroes of Hiphoprisy, Spearhead), but his passion for this particular project shines through on every track. Whether singing, rapping, or experimenting with a combination of the two, Franti expresses himself in rare form. This groundbreaking album will only add to his already sturdy reputation as a speaker for social justice and human rights. “Yell Fire! Is a masterpiece.